Wednesday 7th July 2010: The only way is up! It's been a busy year so far and it will continue to be. So far we have attended eight shows, two NHRA races in the USA, the first two rounds of the FIA European Championships, as well as being out testing or getting seat time with Albert at least once per week. 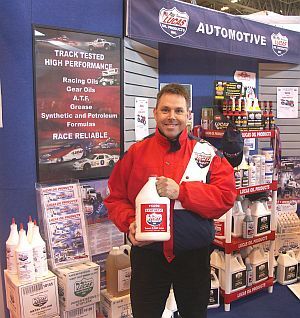 I went over our very successful appearance at the massive Autosport Show at the National Exhibition Centre in my last blog which was February 2010. I don't want to go into the races in the USA with Terry Haddock as they were a complete disaster. All I would like to say is sorry to all the people who supported me, I let you down and I should have known better after February 2009 with Haddock. Hopefully sometime in the future I can make it up to these people that supported me. The Main Event was another bad result for me qualifying seventh and losing in the first round. We chased the car all weekend but never go to grips with it, if we hadn't lost Saturday to rain I'm sure performance would have been better. It is great to have Urs Erbacher back in the FIA Championship, what a weekend for him, qualified number one, won the event, set low ET and reset his own FIA European speed record, it don't get much better than that. This is one tough competitor, I hope he will continue to focus more on Europe from now on. We had lots of guests at the Main Event including head of Lucas Oil Europe Les Downey and from Lucas Oil USA, Tom Bogner and his son Zak. Zak races Junior Dragster all over the USA and is doing real well, I think this is a name to look out for in Top Fuel in the future! it was great to see them all as well as all the other guests we had, the weather wasn't great for them and our performance certainly wasn't, but I hope they had a good time. I had to make it happen in Finland, a track that I have won at four times, qualified number one twice, set the track record at and was first over 300 mph, all great when you look in the record books, but this weekend was a new one, I had to do well here and hope that Urs went out early. What an action-packed weekend! Not great for the Carter Motorsport / Andersen Racing / Lucas Oil team as we were again chasing the car all weekend, although we did make big steps forward which should see us more competitive in Sweden. Sarah and I arrived in Finland on Wednesday and after picking up our Alamo hire car at Helsinki Airport went straight to the hotel to get settled in, no Albert with us otherwise he would miss four days of school, although we miss him big time it will be good in some ways as we may just get a lay in till 6.30 am, usually at 5.30 am or 6:00 am latest I hear him get up, run to the toilet, have a wee then come running in to squeeze in between Sarah and I. If you don't give him almost instant attention he starts pulling my nose saying "Wake up Dad". Thursday we went to the track for an hour to see the team and do the paperwork with the FHRA. Next we headed to Turku airport to pick up our American tuning consultant Jim Brissette and took him to the hotel. Q1. As soon as I hit the throttle straight in to shake, no chance of driving through it, it was too violent so I had to shut off. Q2. Left great and the car was so smooth and also stuck to the track, smoothest it's been for a long time, then around 500 feet I thought I heard the motor go lean (which was actually one of the header pipes breaking off at the flange) I thought "Shall I stay with it? Yes see if I can get nearer the finish line", but then I was getting pushed to the centre line (because of the broken header) and got one wheel out of the groove then I heard the rpm go up more and the car was shaking and I couldn't see where I was going - time to give up on this one. I ran a 4.35 which moved us up to 3rd. It's always Karsten and Markus who meet me in the shutdown area for the tow back and we were just looking at the broken header hanging by a tiny weld inches in front of the back tyre, Karsten was saying "Good driving job Andy" when next he shouted "LOOK OUT!". I looked up to see a dragster sliding backwards with sparks, dust and parts flying everywhere, motor revving and it looked like it was coming toward the turn-off where we were. I thought "F***, Stig's crashing", then I saw a red dragster almost wrapped together with it and thought "S***, Risto's crashing too!". I started to run towards then and teo marshalls shouted out "Andy, NO!". I kept running, and then they shouted again "Andy, NO!". I stopped and walked back. It was not nice to see two cars crashing like that and pretty emotional for me. Stig was out very quick, we waited until Risto was out and then started the tow back. Much as I want to beat Stig and Risto, you do worry about them when something like this happens and because it's our Top Fuel Dragster class it seems very personal. Q3. In to shake around 300 feet and I had to pedal, then lost traction again, qualified fourth after session three. It was great to see Stig Neergaard back in this session after his crash, the team must have worked so hard to repair the dragster, I think this is a real credit to FIA European Top Fuel. Q4. An improvement in ET as I ran a pedalled 4.30 but others also improved so we dropped to fifth. I know I have talked about the many, many different types of shake you can experience driving a Top Fuel Dragster but the one I'm getting at the moment is one of the hardest to deal with as a driver. You get shake and you think "I can drive through this", then BOOM from nowhere it hits you real hard, you totally lose your vision and if you can imagine hitting a bell with a hammer and the vibration it suffers this is what I could compare it to. What I'm saying is it's not easy to pedal the car quickly with this type of shake, you have to let it settle a little. While I'm here, I'm again gonna get on my high horse. This time it's about Top Fuel Drivers in Europe not getting the credit or recognition from the mass media we deserve. Come on! This stems a little from how I felt after my crash in 2003. Risto and Stig both suffered a real violent and horrifying crash on 290 mph runs and the next day both got back in untested Top Fuel Dragsters (let's not forget these are the world's fastest, quickest, baddest, most powerful and most dangerous race cars) and again drove them without making any fuss, just got on with there jobs, well done Risto and Stig and all involved in those teams, awesome! If that had been a Formula 1 crash at 'only' 190 mph and the driver was back in the car the next day, it would have been all over the world's press. We're hard done by here in Europe I think. Race day was not to be and I lost in the semi-finals to Risto. I feel I'm still driving very well this season and once we get the car going I will be a real threat. I knew my race with Risto would be a tough one, he had a tenth on me from the last round and also had lane choice. I needed a very good light and I aimed to put a 0.030 light on him. I cut a 0.025 which is excellent in a Fuel car (in fact it's excellent in any race car) and was still ahead at the eighth but I felt the car was starting to lose traction. Then suddenly I lost it big time but hadn't seen Risto yet, and still had some good forward motion, so I decided to hang with it rather than pedal. Anyway he was right there and got round me about 800 feet and that was that. We have a great team of people in the Carter Motorsport / Andersen Racing / Lucas Oil camp but I want to say a little bit about Gary Cottingham who has been with me for six years now and, as with all of the team, I often think how we would do without him - they all put so much effort in. Gary's jobs include attending the shows, working the hospitality at FIA events, doing some web updates, writing some press releases and taking photos, and he is also doing a great job running my Facebook page. Thanks Gary it really is appreciated, as is everybody in the team. I must admit I was against the Facebook idea at first but I'm getting into it now, it is great for doing quick and short updates and runs well with our web site at www.andycarter.net. You can find the Facebook page at www.facebook.com/#!/CarterMotorsport?ref=ts. Despite a disappointing start to the season points-wise, life elsewhere is great as usual. Sarah and I are real happy and seem to get stronger and stronger together. She is so lucky to have me. Besides the racing our main focus in life is putting lots and lots of effort in to our son Albert's education and the sports that he loves. He plays football morning, day and night, loves to play tennis and of course there is his Karting in which at the moment he excels. Although only just seven he looks so mature out on a busy race track. Last week at PFI he was quickest in all three qualifiers and then won both races against other racers up to twelve years old. OK so the quality of some of them is suspect but what more could we ask for? For the last year we have been getting ready for the MSA Super 1 Cadet National Championships and we have another ten months to prepare. Albert can compete in this Championship from age eight. It's a tough, tough class with all the best kids in the country, with ages ranging from eight to thirteen. Qualifying in the top twelve is usually separated by a tenth of a second, most have unlimited budgets and Dad's worth millions! But that don't put us off, we have something they can't buy - desire, hunger and talent! We can't really expect to go out and win at this level at just eight against kids some of whom have been in this Championship for four years, but we are aiming high and that is to be in the top ten in our first year. We have some great people helping us. Gary Walker and his son Oliver have been around Karting for many, many years and say Albert has something and are putting a lot of effort in to helping him. Martin Hines and his son Luke the owners of Zip Karts have been fantastic too. Then we have Lucas Oil, Teng Tools, 3t creative, NGK, Rainbow Conference Sets, Cottingham Engineering and Grand Prix Racewear. Of course we are always looking for more support and if you feel you could help Albert in any way and would like to spend some time at freezing cold kart tracks in the winter, please contact Sarah at albertcarter@hotmail.co.uk. Dom Romney a great and up and coming motorsport photographer has also been helpful, he has recently put an Albert Carter gallery on his fantastic motorsport website, it's well worth a look and can be found at www.modernpics.co.uk. Next week we are in sunny Wales for three days at the opening of the new Lucas Oil Store, and then it's off to Sweden for FIA round three. I would like to say thanks to the companies who are again supporting me in 2010: Lucas Oil, Landmeco, NGK Spark Plugs, Pioneer Print, Binamic, Sigma Signs, BMRS Hoses, Yuasa Batteries, CAAR, AACI, Rainbow Conference Sets, RCS Cables, 3t Creative, Teng Tools, Norfolkline, Ultimate Air Brush, K&N Filters, Autotel Race Radios, GPR, VEIDEC, Hol-taj, Auto-reminder.co.uk, Zip Kart and Alamo. Thanks to Andrew and Keith at Stand21 for technical and development support with my safety clothing, check out www.stand21.fr, their stuff is awesome! We will be doing our best for these great companies and also this year we will be doing our best to support Great Ormond Street Children's Hospital and RAF 78 Squadron. 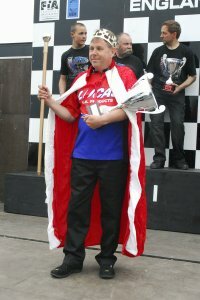 I must also say a special thanks to Les Downey, Tom B, everyone at Speedgroup, Santa Pod Raceway, my lovely wife Sarah who puts up with me and my moods that change more times than a set of lights depending on how my racing is going, anyone who helps me in any way it is appreciated and of course all my friends, fans and supporters. Hope to see you soon, or 'til the next blog. Thursday 4th February: Getting going in 2010! The first show of the year, the NEC Autosport Show in January, has come and gone so quickly. 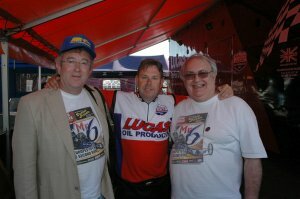 It is a show I love; I get really excited about going to it and spending time with Les Downey and all the other people we meet on the Lucas Oil and Santa Pod stand. This year was no different to the other nine years I have been at the show with the dragster, it was a great time and it just gets busier and busier. I had spent five whole days there, Wednesday to Sunday night, eventually arriving home at 11 pm. The next morning it was no rest as Sarah, Albert and I were up at 5 am to do the theee hour drive to PFI Kart circuit near Grantham where we spent the day testing with Albert before the racing started at 4 pm. It was a rainy, cold day so it was wets all day and get Albert in the van in front of the heater after each session, but the testing and seat time paid off as Albert got a third in the first heat, third in the next and a second in the Final. 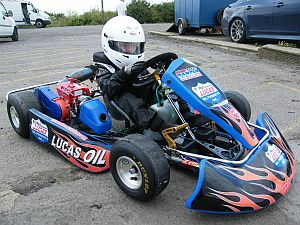 The Kart looked great too in its new Lucas Oil colours. Then it was into the van for the long three hour drive home, within ten minutes Albert was asleep, I don't blame him he had worked real hard and put in extreme effort in the cold conditions. He has that hunger for winning and was crying in the van before the Final saying he was so cold. I said "Don't worry Albert you don't have to do this last race, just relax and get warm", he stopped crying instantly and his reply was "No Dad I want to win it". About a week later we flew to Florida and after a couple of days getting things sorted, I drove up to see Don Garlits and TC Lemons and spent a morning with them in Dons office. Don is so excited about helping me and before I left I said "See you in Pomona Don", he gave me one of those strong handshakes and said "Let's get his thing qualified!". I'm still in Florida right now and fly across to Vegas on Friday 6th February to meet up with Eddie Corr my Crew Chief for the three races, some of Terry's crew, and Terry Haddock whose dragster I'm lucky enough to be driving at the first three races of the NHRA Full Throttle Championship at Pomona, Phoenix and Gainesville. I'm planning to make at least one test run at Vegas, I wanted to do this as it's so important and although I really haven't got the budget for it I'm doing it, it will give me seat time and it will be good to know that the systems on the dragster have at least one test run. Sunday night we drive on to the wrapping company Gatorwraps in California, who are helping me out by wrapping the dragster for a real good price and giving me the loan of a Cadillac SUV for a week which will help cut my hire car costs. Monday is gonna be such an exciting day! The dragster will be wrapped all black, Don Garlits' colours, other main partners on the car are ProCare Rx and Hol-taj, also supporting me at the first three NHRA races are Lucas Oil, BMRS hoses, K&N Filters and Impact and I would like to say thanks to these people and companies for having faith in me, I will be giving it 100% for you all! After Pomona it's then on to the Phoenix race, then a weekend off and then we will be at Don Garlits Museum of Drag Racing in Ocala, Florida to help promote Don's museum and also help launch the book Crazy Horses on the East Coast of America. For anyone who hasn't been, get there it really is a fantastic place, better still try and get up on the weekend of the 6th-7th March, see the Museum cars, and get up close and personal to our Top Fuel Dragster. The next weekend it's off to Round 3 on the NHRA Full Throttle Tour, the Gatornationals. This is gonna be a real big one being Don's home race! And also a lot of fans come over from the UK for this one. A week later we fly back to England to carry on with the second show of the season where we will have a stand at the Easter Thunderball at Santa Pod Raceway, then pretty close to each other we have another four shows and then it's into Round 1 of the FIA European Championships. I'm looking forward to the FIA European Championships starting and getting together with Karsten, Per and all the team again, it's gonna be tough to live up to what we achieved during 2009 but you can be sure that I'm as hungry as ever and ready to take on everyone. I'm sure most will be gunning for me as usual, just the way I like it. While I'm talking about the FIA European Championships I would like to say thanks to the companies that are again supporting me in 2010: Lucas Oil, Landmeco, NGK Spark Plugs, Pioneer Print, Binamic, Sigma Signs, BMRS Hoses, Yuasa Batteries, CAAR, AACI, Rainbow Conference Sets, RCS Cables, 3t Creative, Teng Tools, Norfolkline, Ultimate Air Brush, Impact, K&N Filters, Autotel Race Radios, Impact, GPR, VEIDEC, Hol-taj, Auto-reminder.co.uk, Zip Kart and Santa Pod Raceway. We will be doing our best for these great companies and also this year we will be doing our best to support Great Ormond Street Childrens Hospital and RAF 78 Squadron. I must also say a special thanks to Les Downey, Pelle Lindelöw, everyone at Speedgroup, Santa Pod Raceway, anyone who helps me in any way it is appreciated and of course all my fans, friends and supporters. For those that are interested please check out my full 2010 schedule at www.andycarter.net/schedule.php. Hope to see some of you soon. Tuesday 10th November: Update from Starbucks. I wrote in the August blog that we were travelling back from Germany on a high, well this time are travelling from California and we are on that high again! Sarah and I are sitting in Starbucks at LAX travelling back from a meeting with Tom at Lucas Oil. Sarah is getting to be a real asset at the meetings and I feel like I always want her with me now in meetings, she has gone from being real shy, nervous and saying "I don't want to come" to being confident and providing good input. 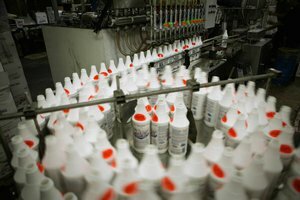 We were so excited about going to see Tom and all the people at the Lucas Oil factory in California, one of two factories which Forrest and Charlotte own the other being in Indiana. Again we had to leave Albert with the best Mum in the world, my mum Molly, and we knew we were going to miss him. We wanted to take him to meet them all at the factory and although he is starting to understand that we have meetings with sponsors and the importance of shaking hands with people etc, it would have been a very long day for him. I decided to write some notes and leave them for him, I gave these to Mum and she put one or two out around the house each day and then he found them. When I spoke to him on the phone each day it was nice to hear him say "Thanks for the notes Dad, only one sleep and you're home". We landed in Los Angeles on Tuesday afternoon and after picking up our hire car drove the hour and a half to our hotel which was only about ten minutes from the Lucas Oil factory. That evening we met with our American tuning consultant Jim Brissette and his lovely wife Carol and had a nice meal with them, it was great to catch up with Jim away from the race track. I have learnt so much from him in the short time I have known Jim, he really is a clever man who talks common sense and would be a major asset to any drag racing team at any level. I hope that he will be with us in 2010 but as he is now working as a tuning consultant with Kenny Bernstein's Budweiser Team this may be difficult, time will tell. About 45 minutes to our flight now and Terry Haddock has just called, we have missed a couple of calls in the last day or two and I had to let him know that the company that I met with after the Lucas Oil meeting decided not to support me at the Pomona race this year. My last ditch attempt at getting a budget to join Erbacher, Joon, Nataas and Neergard at the NHRA Finals had failed. We decided to meet at the PRI Show in Orlando in December and sit down and see how we can go forward. I would still like to do one race at the beginning of the year in America and one at the end, this would fit in well with my FIA European Championship and show schedule. Terry's a real good bloke and although everything back in February was not quite as I liked it, I really enjoyed racing with him. ...then it was back on to the tour. This time Jeff was showing us round as Tom had been called to another meeting. 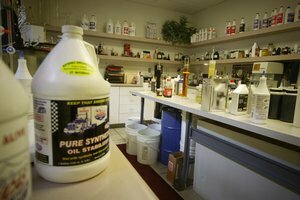 Next was the shipping department where all the oils, greases, problem solvers and Car Care products are put on to pallets and sent out all over the world. Last stop was the clothing department where Sarah was let loose to pick anything she wanted. She was like a kid in a sweet shop, saying "Yes I need two of them, three of them, have you got any Sweats in Small, any handbags (I'm serious)?". After spending twenty minutes with Sarah Raphael, the guy helping us in the department, got down to the serious stuff and picked out my order of crew wear for the team. Then it was back to Tom's office for a general chat about 2009 and 2010. 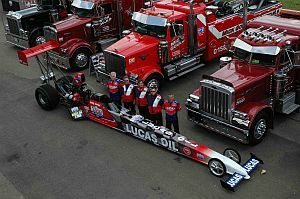 The great news is that my relationship with Lucas Oil is getting stronger and we will continue to work together in 2010. I'm determined to do better for Les Downey, Forrest, Charlotte, Tom, Jeff and everyone at this fantastic company and I'm gonna work harder than ever. About one month before our meeting we had sent in a marketing proposal regarding Albert's karting and the other great news is that Lucas Oil have decided to support Albert in his karting career. We called Albert after the meeting and he was jumping up and down screaming "Yea I'm a Lucas Oil driver!". 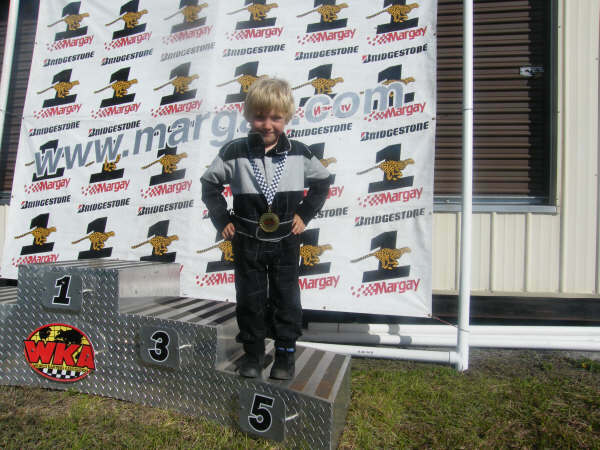 Now we have to make sure we do a good job for Lucas Oil on the karting scene too. 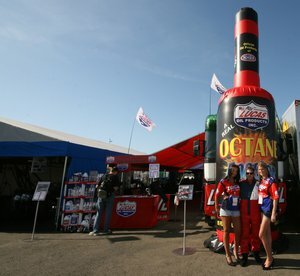 Look out for Albert's rebranded Lucas Oil site soon at www.albertcarter.com. Thanks for reading and see you next blog. Wednesday 30th September: Done and dusted. Since I last blogged the FIA European Finals has come and gone, along with my record run of round wins. Although I lost in the semi-final it has been a very special year for the Lucas Oil / Carter Motorsport-Andersen Racing Top Fuel Dragster team. We were just four seconds away from making every final in 2009 but due to a mechanical failure we just didn't quite make it. Within an hour the team had found the cause and we can do our best to make sure it won't happen again, but it just shows how tough this sport is when you have all the knowledge of Karsten, Per, Jim Brissette a nd the team and still we are learning stuff. I would like also like to say thanks to David Lloyd Jones, everyone at Santa Pod Raceway and everyone at Santa Pod Racers Club. It's been a great year, not just for the racing but also for the many promotional events we have attended at Santa Pod this year. 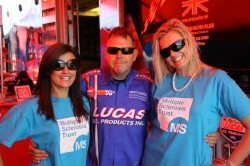 I hope to carry on working closely with Santa Pod in 2010 and to carry on promoting Lucas Oil and Drag Racing. To Karsten Andersen, Per Andersen, all the Andersen Racing / Carter Motorsport Team, all the fans in England, Finland, Sweden and Germany I really hope I'm lucky enough to be able to see you next season. Thanks also to Eurodragster.com for the tireless coverage of drag racing and of course all the other sites which support and help me. Thanks to all of our associate sponsors: Landmeco, Impact Race Products, NGK Spark Plugs, Binamic, Pioneer Print, K&N Filters, Yuasa Batteries, BMRS, Sigma Signs, Rainbow Conference Sets, 3T Creative, Norfolkline Ferriers, RCS Cables, Teng Tools, CAAR, Autotel, Jerrys, AACI, Ultimate Airbrush, ZIP Karts, GPR and Hol-tAj. To anyone I've missed, I do appreciate your help and support. Sarah, Albert and I are in Florida for the next three weeks so it is great to be able to relax for a while and enjoy the fantastic weather that is here. I would still love to be able to compete at a race in America before my season starts in Europe next year, so if anyone out there can help or knows of anyway that can help in any way please get in touch at cartermotorsport@hotmail.co.uk you will get a great return for your money, not many work harder for their marketing partners than me! That's it for this blog; it just leaves me to say good luck to the Andersen Racing Team and Thomas Nataas in Vegas and Pomona. I wish I was in the hot seat and with you lot! Have a great time. As I write Sarah, Albert and I are on the Norfolkline Ferry between Dunkirk and Dover heading home on the Monday after the FIA race at Hockenheim Germany. It's been a great journey back with lots of family sing alongs to the CDs in the car, it really is a great feeling to know that I'm the FIA European Top Fuel Champion for the second season in a row, the pressure is now gone and I'm going to try and enjoy myself at the Santa Pod Raceway FIA Finals in September. This doesn't mean I will lose focus, I will be as focused and hungry as ever, I'm going there for three reasons: to win, to do the best for Lucas Oil and my associate sponsors and to see the fans who give me so much support in England. We drove out to the Hockenheim race last Tuesday morning and arrived at the track on Tuesday evening, had a quick look round and then headed back to the hotel to get the little man into bed at his usual time of 7.30pm. We were really excited about having Albert along for this race as he had missed Finland and Sweden due to Karting and school but we also knew that it would make the week a bit tougher due to his boundless energy levels! Wednesday after a good breakfast in the hotel we headed out to the track about 9:00 am, we had bought Albert's little Motocross bike with us so wanted to let him spend a full day on it at the track while there were not too many people around. As Rune's two trucks were the only rigs in the Top Fuel pits we parked near them, got Albert's kit on and let him off to ride up and down the start / finish line straight of this famous race track. I was pretty sure Rune was asleep in his truck and said to Sarah if that don't wake him up nothing will! Sure enough after fifteen minutes of Albert going flat out up and down out appeared Rune and Lindsey. It turned into a real nice day sitting chilled out round a table drinking tea and eating the occasional bits of food with Rune, Lindsey, Risto Poutiainen (a fellow TF driver) Risto's wife Lulu and one of Rune's crew Tony Pearson. Risto had bought his five year old son Yousa along and it was a great relief to us that Albert and Yousa got on well and so would keep each other occupied during some of the long weekend. I know I and Rune had our differences at the end of my spell driving for him but they are well behind us and we get on better than ever, he is a good man. I won't go into the race as it's more than covered on the internet at Eurodragster.com and on my own web site but I will say what a great weekend for Forrest Lucas, Charlotte Lucas and everyone at Lucas Oil, with Morgan qualifying #11, winning the Lucas Oil race and qualifying for the Countdown to One, Shawn Langdon also qualified for the Countdown to One, while in Germany I qualified second, won the event and won the FIA Championship, it don't get much better! 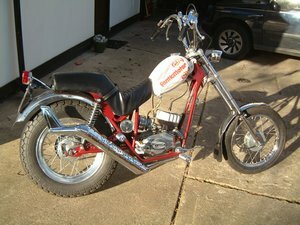 Next Saturday I'm at the opposite end of the speed scale as I will be out on a Sports Moped run in Kent with about seven mates. It's quite hard to understand but sports mopeds were around between 1971 and 1978 and were then banned in 1978 because too many teenagers were getting killed on them, anyway nearly everyone in the club owned one of these machines when they were 16 in the 1970s and we are all reliving our youth and all have near enough copies of the bikes we owned when that age. It's just a great feeling when you're out on a run, you really do feel 16 again, and all the bills melt away, well they do for me anyway! 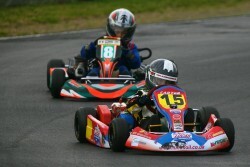 Then Sunday we will be out karting with Albert. That's it for now; hope to see some of you at the FIA European Finals. Thursday 16th July: Another round, another win! So, after round one under glorious English sunshine, what would FIA round two bring in Finland? Having seen the weather play such a huge part in our FIA European Championships over the past few seasons, I'm sure all the teams were hoping that The Main Event was to set the tone for future rounds. The weather had been amazing, the racing spectacular and the atmosphere at the place was hard to put into words. Basically, everyone inside Santa Pod Raceway was enjoying one of the best races put on in Europe for a very long time and you could feel it! The added colour of the Crazy Horses book launch and the return of the big guns of the past was the icing on the cake! Now I know that some will simply glaze over here and I'll probably be denied admission to future Drag Races but in between the two rounds, I had the time of my life at the British Grand Prix! There, I came out and said it, I like roundy roundy racing too and I can't help it! Last years race was my first taste of F1 and I guess I couldn't have picked a better one. There was loads of controversy around the announcement that the 2009 race would be the last at the famous Silverstone venue, Lewis Hamilton put in one of the best 'wet' drives in F1 history to win the race and my mate got his hat signed by Mr Hamilton himself! My friends and I had such a laugh that we were all booked up for this years race by last Christmas, hotels were all sorted and we were ready for 3 more days of racing with bends! Doing the 3 days really gives you a chance to take it all in from F1 practice to historic saloons and GT racing, there's plenty to watch and merchandise to spend your hard earned cash on. I tell you what, an AC tshirt is a bargain compared to a Brawn GP white one with a black and yellow stripe on it! And you don't get them coming out before a race and throwing stuff into the crowd either! Seriously though, what can we learn from what is the pinnacle of motorsport in terms of following, global coverage and funding? I guess, it simply shows that with money, you can do anything! That's what us bigger teams need to keep working on, attracting the big names to our sport, helping them to realise that for a fraction of the cost, they can achieve huge exposure with branding on the side of a TF dragster, rather than spend thousands/millions more to have a logo on Lewis's dust cap! If sponsorship can be found for our various pro classes and the TV package, as well as what we can achieve as teams, then I believe we'll have an impressive package on our hands. I tell you one thing we do far better, public contact! You don't get near an F1 driver or crew, we only got my mates hat signed through simply being in the right place at the right time. This year, the Brawn boys were driven to the public area to do some interviews and you couldn't even get close. They were then whisked off in a blacked out vehicle with tight security and a few limp waves for the fans who'd gathered for hours just to catch a glimpse of their idols. By contrast AC who is getting busier and busier at the races will still always try and have time for fans. Anyway, I hope I can be forgiven for my enjoyment of Bernie's circus and I also hope that you won't all be nasty to me next time you visit the Lucas Oil pit. Meanwhile, back in a straight line, how would Finland compare to the FIA season opener at the Pod? It has to be said that for Andy and Carter Motorsport, this really has been a great hunting ground for us. In seven attempts, AC has walked away with event honours on no less than three previous occasions, four out of eight would look even better! He was also the first over 300mph in Finland and has set the track record at least twice at this event! Before the race, there had been much discussion between the TF drivers about the distance to run over in Finland and it was decided for safety reasons to run over the 1,000 foot. This also happens at Mantorp Park in Sweden where the run off area is very short, whilst in Finland the top end barriers are not long enough so safety is a concern. I think we in Europe need to get used to this new distance in Top Fuel as we pretty much always follow the NHRA and with them now running a thousand feet, it's surely only a matter of time. AC made the point in his Q&A on this that it does make the running costs cheaper and we may see some who've sat on the fence, finally take the plunge and join the TF ranks. By mid-day Friday, our fears of another day being washed out were relieved as the sky brightened up and.... then someone dumped oil, lots of the stuff and the first Pro qualifying session did not make it in before the curfew. This meant that we were faced with only two shots at qualifying on the Saturday and after a 4.992 (the sort of numbers you'd expect on a full 1/4), the pressure was really on for Q2. By the end of this second session, Timo Lehtimaki sat on the bump spot with a 4.80 and AC and the Lucas Oil car were number 1 with a stout 4.12, we were on course for another, memorable weekend! Timo lit the tyres in round one so our 4.15 was good enough to line up along side Risto Poutiainen with AC having lane choice. It's great to have Risto back in Top Fuel and he's certainly not at the party just to make up the numbers. Performances have been strong and were improving so this one would be tough. A 4.21 from the Lucas Oil car to a close 4.32 was just enough to see AC pair up against Stig Neergard in the final, a repeat of The Main Event. AC really earned his pay in the final winning on a holeshot, 4.10 to our slower 4.12. Click here, to check out the points going into the next FIA round in Sweden which should see 12 TF Dragsters battling to get into an 8 car field! The next weekend after Finland it was back to the promotional tour where we appeared at the Retro Show, this coming weekend we will be showcasing the Lucas Oil Dragster at the massive 90,000 people Bug Jam at Santa Pod, then on the Monday Andy & Sarah fly out to Sweden, AC is as focused as ever, in fact it seems like his focus gets stronger every year and I know he is thinking about nothing but a 4th FIA Top Fuel Championship. We're hoping to do updates from Sweden so please check in here, www.andycarter.net/events/2009/ during the event for news on how the team is doing. Away from my duties for Carter Motorsport, I look after Andys son Alberts website. 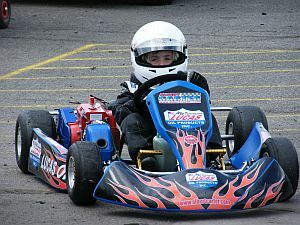 I recently got a chance to spend an afternoon Karting with him at PFI in Grantham and this really is a star of the future! Just 6 years old with 2 years experience it was amazing to see him beat kids of 9 and 10 years old! 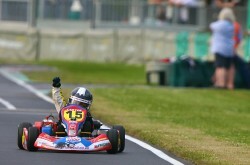 Check out his site at www.albertcarter.com especially video 6 with Albert weaving to warm up his tyres on the rolling lap! Firstly sorry for the long delay between Blogs, it's been pretty manic at Camp Carter and so much has happened since the last one! For a start, the sun has made more than its fair share of appearances of late, this in turn helped to provide one of the best drag race meetings seen on these shores for some time but more about that later. 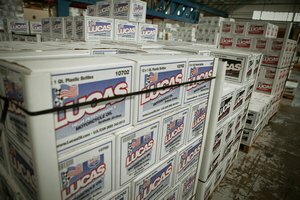 With our marketing partnership with famous oil brand Lucas Oil, one of our primary jobs is doing all we can to promote the companies superb range of products to as wide an audience as possible. To achieve this, the team have an incredibly busy schedule of promotional appearances on top of our race programme. To date, the team have attended seven shows in 09 to a varied audience, including monster truck fans and American car enthusiasts. These events give us the chance to not only promote Lucas Oil but also introduce the fantastic motorsport that is drag racing and of course its pinnacle class, Top Fuel. 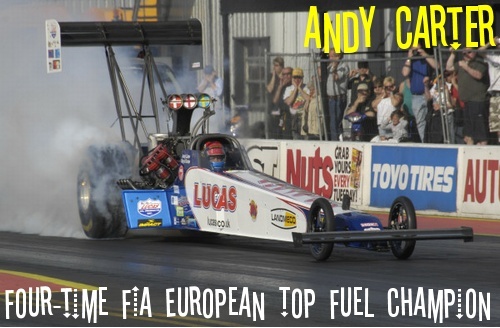 Introducing them to Andy and his hugely successful Top Fuel career has been made a great deal easier this year with the release of his new book Andy Carter - King of Europe. It really is a great read (and I'm not just saying that because I wrote it!) and we've been delighted with the success to date. If you've not got your copy yet, why not visit our site now at www.andycarter.net and grab a copy? You won't be disappointed! Shameless plugs aside and on to the serious stuff. There have been a great deal of changes to the TF regulations over the winter and this has meant a huge amount of work once more for the European crews. Our car has had a new chassis from the seat back and from the pedals forward courtesy of Mats Eriksson, a complete new body, all new brackets for the timer and management systems, new roll cage, titanium shield and a new moulded driver's seat! Needless to say, it was a massive relief for the UK contingent to head to the race shop in Denmark two weeks prior to our first competitive outing and find the car looking awesome and ready for battle. Andersen Racing always deliver a fantastic car and this year, all the stops had been pulled out to provide Andy with a mean machine, capable of carrying him to what would be an unbelievable fourth FIA Top Fuel crown. Last season everything clicked into place for us as a team and all eyes were on the Lucas Oil / Carter Motorsport / Andersen Racing Fueller as we set the bar as high as possible. We recognised that this year would be no different and we needed to hit the ground running. 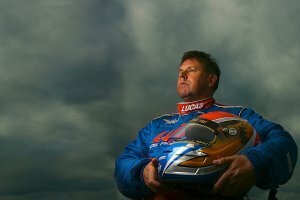 The colour scheme had been updated too, with the Lucas red now changed to the Lucas blue, very similar to NHRA TF pilot Shawn Langdon's colour scheme. When the metallic paint hits the light, the car really stands out! We were also delighted to welcome some new names to the sponsors list including the massive Impact Race Products, owned and run by Bill Simpson and UK based Ultimate Airbrush who had applied the design to Andy's new carbon fibre Impact lid. Both companies have more than delivered with the artwork on the helmet looking amazing and all the Impact safety equipment we have been provided is of the highest standard, from the crew footwear to the the new parachutes! All our safety gear sailed through tech at the first time of asking and I have to say, it all looks the business and we would like to thoroughly recommend the range to all our fellow racers. On the marketing front, it's been a hectic time of refreshing the web site (thanks to our site sponsors Binamic), producing new hero cards and other marketing material, as well as launching our new initiative AC to the USA. Following Andy's successful first NHRA appearance at the Kragen O'Reilly Winternationals, Pomona, it's very much our intention to return to the NHRA circuit after our FIA Top Fuel season concludes, only this time we want to do it with our car and the Super Crew! The initiative is basically designed to provide the funds we need to achieve this. There are two main ways this can be done; buying a raffle ticket to our massive prize draw or pledging financial support either personally or as a company. The draw prizes include flights to the USA, a trip to an NHRA event as well as other great items such as Andy's 2008 Championship-winning helmet. The financial pledge scheme starts at £50 for an individual and £1,000 for company support. I'm sure there aren't too many other openings for companies to sponsor a car at an NHRA meeting for this amount! Find out more and back our ambition at www.andycarter.net. You can have the best of everything on paper, sponsors, car, parts, products, marketing, funding etc but it's not worth anything unless you can back it all up on the track. Andy and the team have proved over the years that we are leaders in the sport but this comes with the added pressure of all eyes being on you at all times and the expectation to lead. 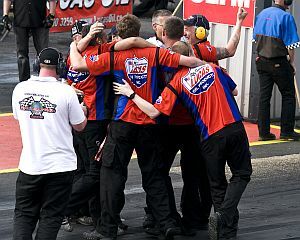 As the team arrived at Santa Pod for the first FIA round of the season, the pressure was on to hit the ground running and pick up where we left off last September...number one! The Main Event is always a special meeting. 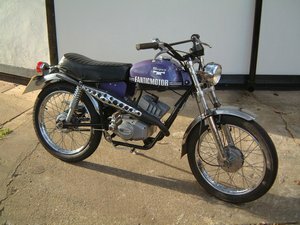 It's the first chance that many European racers have to thrash their cubic inches in anger and debut new machines that have only been seen as spy pics to date on Eurodragster.com. 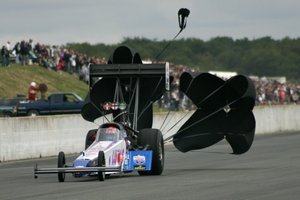 The Lucas Oil TF Dragster had been one of these, with a series of close-up shots having been taking by team photographer, Gary Cottingham and presented over a five day period. 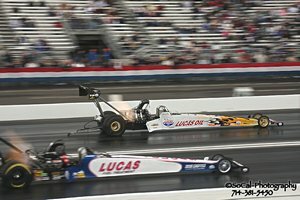 For a while leading up to the event, it was looking like the Top Fuel cars may be down on numbers but a healthy nine cars showed up for the season opener. By Saturday however, we were down to eight after Denmark's Tommy Rostgaard hitched up the plough and headed for the top end field! Tommy was fine but the same couldn't be said for the car which was a shame as he'd shown real promise on his licensing runs. As mentioned at the top of the Blog, the weather was amazing and four days of sunshine meant that the racing was not effected by English weather for once! This meeting really did have it all with PBs and European records falling all over the place, the best qualifying session seen in Top Methanol Dragster for years and the launch of a fantastic new book, Crazy Horses, very well written by Brian Taylor. 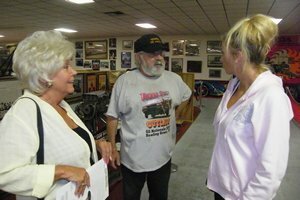 I mention this because the book launch attracted a host of drag racing stars of the past, many of whom had not been seen at the Pod for years and their presence helped to make this event that bit more memorable. Most of the prestigious guests I knew by name only and had never seen race but I felt like a kid at the Haynes Publishing launch, as I went in search of signatures for the cover. It was a pleasure to meet Pete Crane who was a lovely, genuine guy but the highlight for me was DLT. Dave Lee Travis was hugely popular as a Radio1 DJ and as a Top Fuel pilot in the late 70s. I was really chuffed when he asked if he could come back to our pit with me and take me up on the offer to meet Andy and the crew. He is a great, down- to-earth guy, making his first return to the Pod for 30 years but I think it's safe to say he'll be back soon...maybe in September for the Finals! Dennis Priddle, another Top Fuel legend, was another welcome guest in our pit. 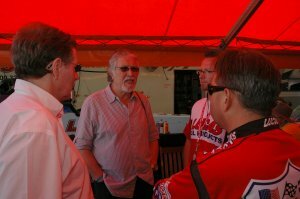 It was great to see the biggest names of Top Fuel past, wanting to spend time with us and find out how it's done in 2009. We wanted to show them the very best of modern Top Fuel, it was time to deliver on the track. I'll be honest (and I'll probably get slapped for saying this) but the lack of any form of testing prior to the event was a concern. With so many changes being made to the car, I think an extra day would have pulled us up to speed nicely for qualifying. As it was however, the first couple of qualifiers, pretty much served as testing runs with most of the teams struggling to get the new combinations down the track. There was also a definite bias towards the left lane for the fuel cars which I think was proven over the weekend. We opened our account with a twelve second pass, completely overpowering the track. With only five cars making Q1, this wasn't a disaster as only Lex Joon and Micke Kågered ran anything of worth, both laying down low fives. Q2 would see slight improvement but still not the numbers we were looking for, a 5.91 only good enough for fifth and the car looking like a completely different animal off the line to last year. Some work was needed with the tune up and the heat was not making life easy for the TF tuners. Per and Karsten Andersen are simply the best in the game when it comes to tuning decisions, we also had Jim Brissette with all his experience and don't forget if any one can get a car down track it's Andy! I think we were all quietly confident that the numbers would come. A glorious day greeted us on Sunday and the expectations were high for some great Top Fuel passes. The Lucas Oil promo team (Phil, Gary, Paul, Louise and myself) were out before our runs throwing t-shirts into the crowd to add to our impact. I love doing this as the crowd are always up for something for free and it's become a signature feature for us, prior to Andy's run. On track, however, we were still struggling as Andy blew the tyres off at the hit. Lex and Risto Poutiainen set the mark at 4.83 during this session and with only one more to go, the pressure was on! A much improved 4.91 in Q4 was much more like it but with the blower belt off at three quarter track, our number one qualifier ambitions were gone and we had to settle for fourth. We would now face Linda Thun Tønseth in round one. A 5.01 was enough to see us through but again, it looked like a chucked belt had caused the off-pace numbers. Closer inspection in the pit however, revealed a rod out and a serious thrash followed to have the car ready for our semi-final match up with Andy's rival Lex Joon. Following the rain-off at last years final, many were seeing this as the chance for Joon to either avenge the loss of the title or for AC to stamp his authority all over the Championship. Andy delivered with a sweet 4.80 to Lex's 5.19 and we were in the final to face Stig Neergaard. Stig is always tough opposition and his new car for 09 was proving to be a competitive ride. No t-shirts before this one, as it was time to get very serious! Andy was out first but it was tight at half track until Stig's tyres went away from him. Andy suffered similar problems in the last 500 feet but stayed with it to record a 4.90 and take the win, picking up where we left off at the end of last season. Knowing how tight these FIA Championships are, the bonus points collected for low ET of the meet will also come in very handy come September I'm sure. The podium celebration in true Andy Carter fashion, created a few comments. Hey I've said it before and titled the book, the guy is the King of Europe! Wednesday 25th February: January was a busy month! Next day I was up early for a drive to Oxford for one of the first big Banger Racing meets of the year, the Heavy Metal Classic at Standlake Arena. At age 11 I met and started helping Championship winning Banger Racer Ken Knight, Ken was the captain of Watford Banger Racing Club and at weekends we were either away racing or stripping out an old Rover, Vanden Plas or Jag to make it ready for some action! That's why this motorsport is in my blood: I just can't get it out and try not to miss any of the big unlimited Banger meets during the season. When you have forty plus Bangers on a quarter mile oval and the green flag goes down it still makes the hairs on the back of my neck stand up. The day was cold with temperatures not raising much above -2 but it was a great meeting all the same with an entry of 260 cars, I really enjoyed it even if I did have to head back to the car for fifteen-minute warm-ups every couple of hours. Monday was another great day! I got the confirmation from Lucas Oil that they would support me in my first ever NHRA event, the Winternationals at Pomona. I was buzzing for days on this news and it was also good to hear the excitement in Sarah's voice when I told her on the phone that evening. There was now a lot of stuff to do. At that moment in time I had no race clothing - having decided that I would replace everything for 2009 - no NHRA licence, no NHRA medical certificate, I was not booked in to the race, there was no crew wear nor start line shirts, the dragster was not ready (but Terry had that covered), no flights, hotels or hire cars booked, and lots of other small stuff that goes with entering a race of this size! 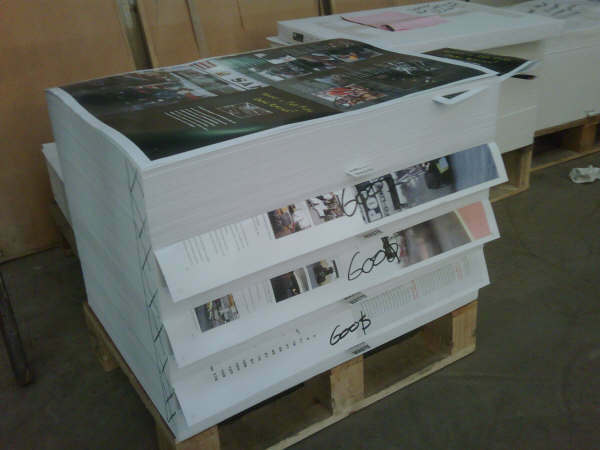 On Tuesday I drove down to see Peter at Pioneer Print in East London to pick up my book King of Europe. They did a fantastic job on the printing and binding, thanks Peter. I can tell you it was a lot of weight off Dan Welberry's and my minds to see the finished article. If we do another book, which we have talked about, the best thing to do is keep my big mouth shut and not put a time scale on it! On Wednesday I was at the doctor for my NHRA medical which went fine. It's easier than the FIA medical for my European licence, part of which involves being on the running machine for twenty minutes with all sorts of wires hooked up to you. I will let you know how that one goes after I've been in March. On Thursday Lionhead and I took the truck and trailer up to the Autosport . We were not scheduled to unload until Friday evening but I wanted to be one of the first in the queue which is always good. I spent the rest of the morning going round spending time with sponsors RCS Cables, BMRS, Autotel, K&N, NGK and of course Les at Lucas Oil. At lunchtime I met with Andy Rogers, aka Tog the main man at Eurodragster.com. 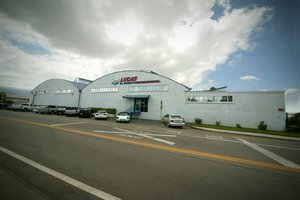 In the afternoon did an interview for Lucas Oil's Technical Talk and then it was on to meet with John at Impact Racing Products to be measured up for my new firesuit, helmet, driving boots etc. By Saturday Dave, Rich, Stu, Gary, Phil and Dan had arrived and they all worked really hard handing out hero cards, talking to the public about drag racing, Lucas Oil and the workings and facts of a Top Fuel Dragster. One of the great things about Autosport is that most of the public are not drag racing fans, so we are speaking to a new audience, and it makes it all worthwhile when you're at a race and someone comes up and says "I met you at Autosport and you are right this drag racing is a great sport!''. At 2:00 pm on Saturday at 2pm we did the book launch and although interest was not massive I would say it was a success! Tuesday January 13th: I was up at 5.30 am and at 7:00 am the cab arrived to take me to Gatwick Airport for the flight to Orlando. The aeroplane touched down at 6:00 pm and I managed to get though Orlando Airport in forty minutes which, if you have ever flown into that crazy airport, is a record. It was great to see Sarah waiting for me. Albert as ever was up for a laugh and was hiding behind a chair, then came running out at me, "Dad, I've missed you!''. I had really missed Sarah and Albert too. The first couple of days in England were great, I was thinking "Peace and quiet", then it all changed and I started to miss them like mad. I was glad to be back even if I had forgot how many questions Albert asked and how noisy he is! Wednesday January 14th: Sarah booked the flights to LAX, the hotel, and the hire car. The bad news was we had decided to leave Albert in Clermont with my Mum. This really hurt as I wanted Albert to be with me at my first NHRA race but he would have missed six days of school if we had taken him along, so I'm sure we did the right thing. Thursday January 15th: I got a call from Sean at Motorsport News who asked if I would be interested in keeping a diary in the lead up to and during the race weekend. If so, they would put some pages by for me. It's always great to hear from Sean, he is so enthusastic about everything and does a great job in his reports for drag racing in Europe. At first I said “No, sorry Sean, I just want to enjoy this race and be 100% focused”. Later on, chatting over tea with Sarah and my mum, I told them of the phone call from Sean and I started thinking about it again and thought of a plan. My ex-Crew Chief Eddie Corr was coming to the race and as well as helping me out was going to write a race report on his web site at eddiecorrracing.com. I asked Ed whether he could do a report for Motorsport News just about me? True to form, “No probs AC” was the reply, so I called Sean and let him know the change of plan which was fine by him. Look out for the report in MN out Wednesday 18th February, it should be good reading as well as featuring some pictures from the dynamic duo, Roger Gorringe and Andy Willsheer. Friday January 16th: I wanted to do something with Albert as we were not going to see him for a week so Sarah, Mum, Albert and I spent a great day at Universal Studios. 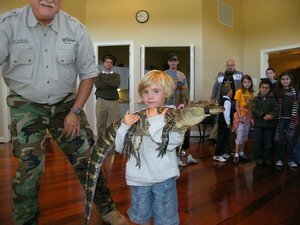 Saturday January 17th: The Events Manager at our community clubhouse had booked someone to come in from Gatorland to give a talk about alligators. Seeing this on the events board we had put Albert's name down, it looked exciting for the kids (and me!) with the promise of two alligators and pizza afterwards. It was a really interesting morning which ended with the chance to hold quite a big alligator, or to have a small one put on your head! 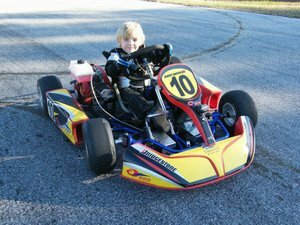 Sunday January 18th: We spent a good day at a local Kart track getting Albert some more seat time. Monday February 2nd: Finally the day had come for Sarah and I to fly to Pomona, we were so excited! Sorry, I'm not going to write the same stuff twice so the stories about Pomona can be found at www.andycarter.net and at www.eddiecorrracing.com. What I will say is that although we had such bad weather, I really enjoyed the event. Just being part of that NHRA season opener was a longtime dream for me, the support I had at the event was fantastic and I'm sure I did a good job for Lucas Oil. We met a lot of new people and also met people to whom I talk by E-Mail but don't see that often. One of those was Rob Geiger of www.go2geiger.com, sorry we didn't sit down and have more time Rob. Another was Tom Bogner, it was good to spend some time with you Tom and I hope Zac enjoys the book. Sunday February 15th: We flew back to England to start our schedule - it starts to get busy now right up to October. 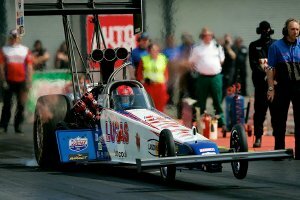 Next stop is the Stunt Show at Santa Pod Raceway on Friday February 20th where we will once again have the Lucas Oil Top Fuel Dragster on show. While I'm here I want to take this opportunity to thank Forrest and Charlotte Lucas, all at Lucas Oil USA, all at Lucas Oil UK, Kelly at Impact Racing Products, Terry Haddock, Richard Bruton, Eddie Corr, Roger Gorringe, Andy 'Don't you know who I a'' Willsheer, all the fans at Pomona, all my friends and family, anyone I've forgotten (sorry), and finally thanks to everyone who E-Mailed: it was great to hear from you, keep ‘em coming to cartermotorsport@hotmail.co.uk. Friday 2nd January: A Carter family Christmas. Happy New Year all and hope you had a great Christmas! Hope you enjoyed my first Blog, it's not easy to write them that's for sure. 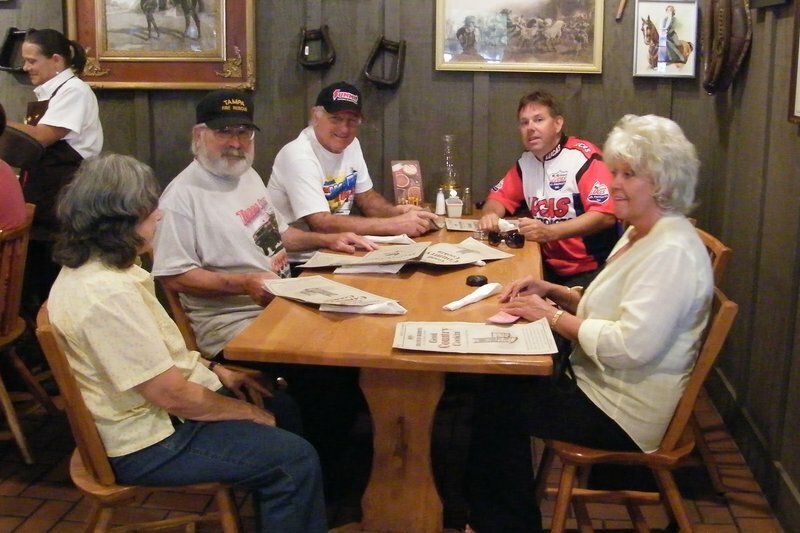 On this early January 2009 Blog I'm going to start by going back to a couple of weeks before Christmas, in fact December 10th when Sarah, Albert, my Mum Molly and I flew back to Florida for the PRI Show in Orlando and to stay on for Christmas in America. No time for a lay in - I hate them anyway - I was up early on the 11th out the door and did the 22-mile drive to the PRI Show. I also spent the 12th and 13th there. PRI is a great show, very similar to the Engineering part of our own Autosport Show. I had a few meetings with some companies, met some good people and generally had a good time, well worth going that's for sure. December 17th, I know it might sound boring but it was a real exciting day for Dan Welberry and I, our book went on the printing press at Pioneer Print! I got a call from Pete of Pioneer Print letting me know it was on the machine and would be on there for the next fifteen hours. Blimey I didn't realize it was that big! He even sent me a link so I could look on the net at the machine working. Next Pete will send it over to have the hard covers bound on, I was so excited about this and was on a big high all day, in fact it lasted a couple of days! Thanks Pete! Most other days were spent chilling out, on family walks or spending too much money in Starbucks. I'm sure it's the same for you, but I can't go anywhere without my laptop, it makes it so easy to keep in touch with people in England, also checking in regularly on my favourite drag racing sites, eurodragster.com, go2geiger.com and topnitro.co.uk. 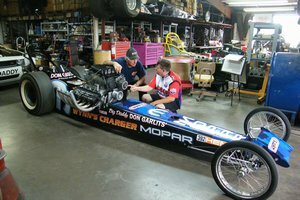 While on the subject of web sites, I don't know about you, but I thought the update on eurodragster.com on December 24th was fantastic. For me it was all great reading, I got a nice cup of tea and sat down for an hour going through it all. The weather in Florida over Christmas was beautiful, up in the high 70s-low 80s, this is great in some respects but to us people from England it can make it hard to get that Christmassy feeling - all my life I have associated Christmas with very cold or even snowy weather, I'm not moaning just being honest! But with Albert going on about how good he was going to be and writing his Christmas present list, which I said I'd email off, I did start to feel it was Christmas! Albert is at the age now where he is really starting to understand this time of year and it was great to have him tell me "We need to put some food out for the reindeers and leave some food inside for Father Christmas". The look on his face was fantastic as we placed mince pies in the drive, then carefully put a glass of milk and a mince pie on the front room table. December 26th Our place is in Lake County, so as you can guess there are plenty of lakes. We all spent the day out on the big lake at Clermont or in the Tikki Restaurant right on the lake. This is a great place for lunch, you can pull your Boat or Jet Ski right up - I've even seen a sea plane land on the lake and taxi up for lunch - jump off, paddle in and have a relaxing meal looking over the lake. While there our neighbours Todd, Stephanie and their three children pulled up in their boat, so we ended up spending the whole day out on the lake with Todd and his family messing around, at 5 we headed back to the Tikki restaurant to watch the sun go down over the lake, what a fantastic day! 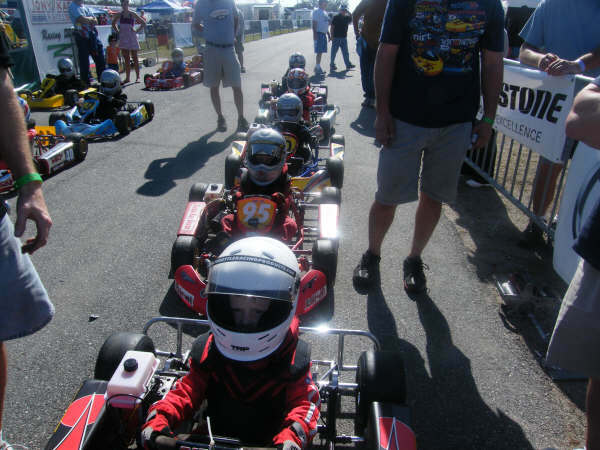 December 27th Another busy day, we headed up to Daytona International Raceway to book Albert in for his first ever points Kart race, the World Karting Association 2008 Margay Sprint Championships. What a place to have your first proper race eh? Daytona! The kart track is on the infield of the famous oval nestled right in one of the turns. I didn't realize how steeply banked the turns are and what a great stadium! After an hour of queuing we got Albert all booked in and got a space in the pits, we managed to get right near our friends of TS Racing Kart Supplies. Raymond of TS had said "Try to get parked near us, then if you need any help during the event we can help you out", thank you, it was appreciated! I then walked the track with Albert going through what I thought might be the best lines, talk about the blind leading the blind! While doing so eight Nascar Stock Cars thundered round on the Richard Petty experience and every time he heard them coming Albert totally forgot about the lines and said "They're coming again Dad! ", turned round and watched the cars thunder by, oh well. It's quite a tight track with at least three hairpins and I left the track that night wondering did we have the right gearing? Then I tried to tell myself "It's only fun, what does it matter". December 28th a 6.30am start, straight into Starbucks, then on to the Florida Turnpike and up to Daytona again for a day of practice and qualifying. After scrutineering I did some last minute checks on the kart and then Kid Karts were called out for practice. I said to Albert, "Just follow the others for the first couple of laps to get to know the track, then try and get going". Considering he had never actually driven this track he did well and stayed in the middle of the pack. December 29th another 6.30 am start and back up to Daytona. Albert had one last qualifying session in the morning and I had to try something to move him up from the middle of the pack. The Micron data logger I had fitted told me that he was getting quicker each session and was now doing one minute dead laps, only trouble was the fastest kids were doing 58-second laps. The rules are very strict in Kid Kart and you can't change the sprockets, modify the exhaust or inlet and you must weigh 150 lbs at weigh in which happens at the end of each session, so all I could do in our limited time was adjust the tyre pressures. I thought if "I'm going to adjust them I might as well make a big change, that way I will know if it really helped or not", so I dropped them by 6 lbs each. After five spins and slower lap times I realized I hadn't helped at all. Lining up for his first proper points race Albert didn't seem to have a care in the world and when putting my head down to speak to him he seemed so calm and focused, the only words he said to me were "Start it up Dad!". Meanwhile I felt like I was just about to get in the Dragster and couldn't stop checking all and sundry on the kart. Sarah, my Mum and I were so proud of Albert in the race, OK he didn't win but he came 8th, but he showed great coolness holding off four karts that were right on his bumper for the last four laps. He was buzzing when he got out at the weighbridge and it was great to give him a big cuddle and as much praise as I could. As I write I'm back in England now and tomorrow (Saturday 3rd) I will head up to the workshop to meet with Phil, Gary, Guv, the Lion, the Las Vegas Kid and Dave to get the Top Fuel Dragster ready for the Autosport Show next weekend. On Tuesday I will be picking up my finished book King of Europe from Pioneer Print in East London to be released at the Autosport Show, can't wait for that one! Thursday I will be at the show and I'm looking forward to catching up with friends and sponsors. Thanks to everyone who emailed in after the first Blog, it was great to hear your views, keep 'em coming at cartermotorsport@hotmail.co.uk. Saturday 29th November: What I did on my holidays. I thought long and hard before I decided writing a Blog is the right thing to do. I think you have to be careful about what you write on the internet because it can so easily be perceived the wrong way, I also have to make sure I take time to go over stuff before I put anything on the internet because I have a habit of saying things I don't always mean. As I've got wiser I have managed to get this fairly under control and it saves me a lot of grief! I also thought where would I want that Blog to be? 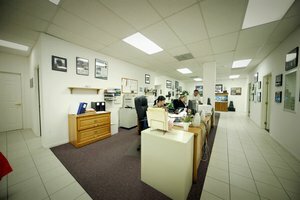 I decided on what I and many consider to be two of the best web sites in drag racing, Eurodragster.com and Go2geiger.com. After contacting these two sites, I was lucky enough to have them both say "Yes, it would be good to have you on board", so here we are, Andy Carter's first Blog. I aim to post once a month, or maybe more once the season starts, if I'm too busy or struggling for words, one of the team will write, which I think will make it more interesting for anyone reading, having different people in the team's perspective on stuff. I have been married to Sarah for nearly ten years now and we have a handful of a son Albert, who is five years old. As I write we have just come back from a fantastic two months in Florida, we decided that after winning three Top Fuel titles I'm going to give my myself a proper break, I have worked really hard for the last fifteen years sometimes juggling another two jobs besides the racing. OK I can hear my close friends saying, the jobs were not physically tough, but mentally and stress wise sometimes it has been very tough. So I said to my family, I'm gonna switch off from racing a little bit for two months and enjoy myself, as I've got older I must admit I've struggled to enjoy myself and sometimes I look at myself and think whatever happened to the old Andy Carter that never worried or cared about much? Sarah and I have spent every day together which is pretty normal for us, I think this is a great part of our relationship that we can be right in each other's pockets for a long time and not get on each other's nerves too much. My love for this woman just keeps on growing, she is great support for me and such a great mum to Albert. Sarah understands me so well (which for anyone else who has got to know me closely will understand can be difficult at first). For instance she knows that when things in racing aren't going my way I can be extremely irritable and rude, she will point this out to me and say "Shut up Andy, just cause you're not Number 1 qualifier don't take it out on me" and this often brings me down to earth, usually with a smile. After thirty six years in motorsport of course you can't just change your mindset and during our break of course I didn't turn off maybe as much as I wanted to. I spent a lot of the days working with Albert training him in his kart in the massive American car parks or at Ocala Gran Prix, a great little track in Ocala just north of Don Garlits museum, we also spent a lot of days at Dade City Motox track where he was having lessons on his KTM Motocrosser, when he does well I come away from them tracks so happy, when he has an off day I have to remind myself he is only five and I can't expect too much. that's it for this one, which I hope gives you a bit of insight in to my family life. By the next time I write Christmas will have come and gone, I hope you all have a great one and if you haven't already seen it or even if you have, sit down and watch the film It's A Wonderful Life. 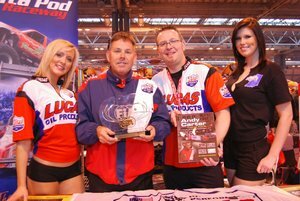 We would also have attended the Autosport Show, appearing on the Santa Pod Raceway Stand with the Lucas Oil Top Fuel Dragster at the National Exhibition Centre in Birmingham England where Dan Welberry (one of my marketing men) and I also plan to release our book Andy Carter - King of Europe. If you have any questions or would just like to say hello, please mail cartermotorsport@hotmail.co.uk. I can't promise to answer all emails but it's great to hear from people anyway.